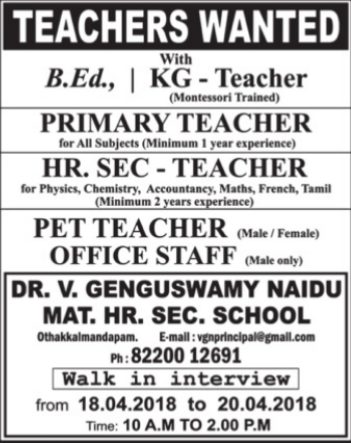 Dr.V.Genguswamy Naidu Matric Higher Secondary School, Othakkalmandapam has advertised in THE DINAMALAR newspaper for recruitment of Teaching/ Non Teaching Faculty jobs vacancies. Interested and eligible job aspirants are requested to attend walk-in 18/04/18 to 20/04/18.Check out further more details below. Name of the School: Dr.V.Genguswamy Naidu Matric Higher Secondary School, othakkalmandapam. Dr.VGN Matric Hr Sec School is a way of life… A culture of values at the core of all that is done… Embellished by the essence of Human Excellence.As a mark of dedication to the society, Dr.V.Genguswamy Naidu, a successful industrialist with a philanthropic mind and care for the society, has started this school in the year 1990 at Othakkalmandapam to cater to the educational need of rural society with a vision of creating the next generation with values, quality education at affordable cost, imparting human values and overall development of personality. 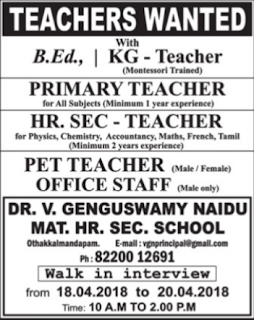 (a) KG Teacher: B.Ed with Montessori Training. (b) Primary Teacher: All subjects with one year experience. (c) Fluency in English is Must. (d) Hr.Sec.Teacher: Minimum 2 years experience.